Highly priced brackish water fish having high demand in South India, especially in Kerala. Favored mostly by foreign tourists. 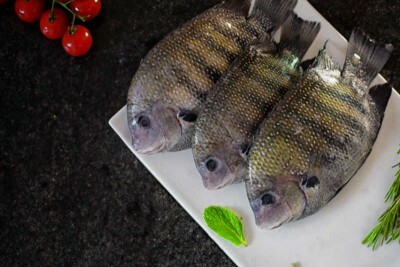 Please note that unlike the fish market where the cutting happens on the whole fish that you take (and thus appears free), we actually charge you only for the final weight post cutting, so a fish that is cut will be much larger in final eatable weight than a whole fish. Here are the general kinds of cuts available (may vary from fish to fish). Please see the specific options available today. Whole: Fresh fish washed and packed as a whole. Fillet: Meat from the lateral sides of the fish is chopped and packed as boneless pieces. You will receive two pieces of boneless meat from each fish. Curry cut: Meat is chopped into small pieces which are ready to cook, either for preparing curry or to be fried.